We recently took another trip to Portland, this time to attend a conference in the convention center. Fortunately for us the closest hotel also happened to be the nicest in the area. 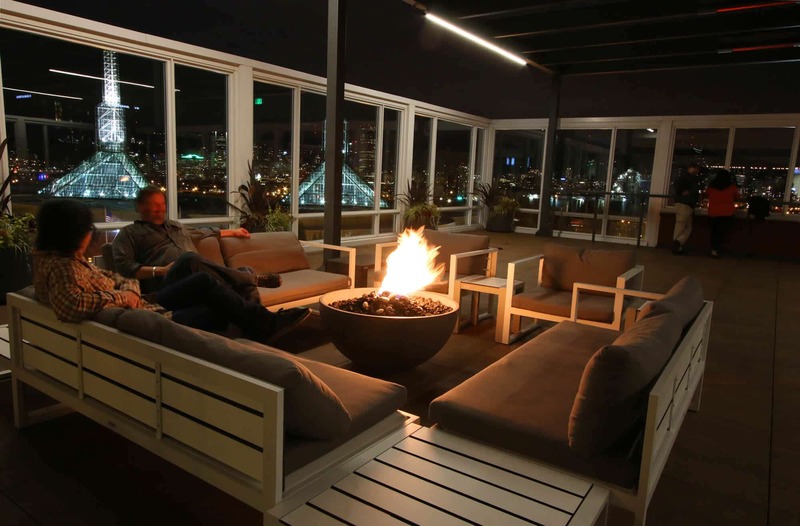 Hotel Eastlund is a new 4-star luxury boutique hotel in Portland’s Eastside. 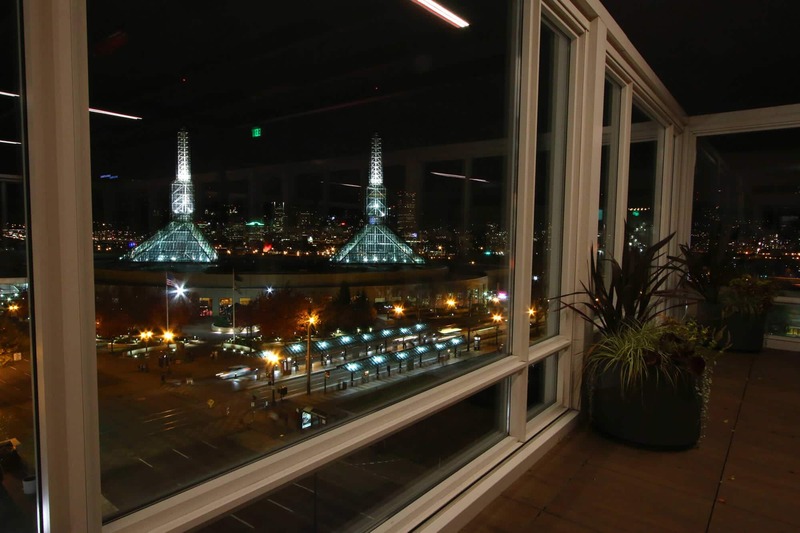 Situated in the Lloyd District it’s right next to the Convention Center, Moda Center and the Veterans Memorial Coliseum and offers easy access to all four corners of the city. 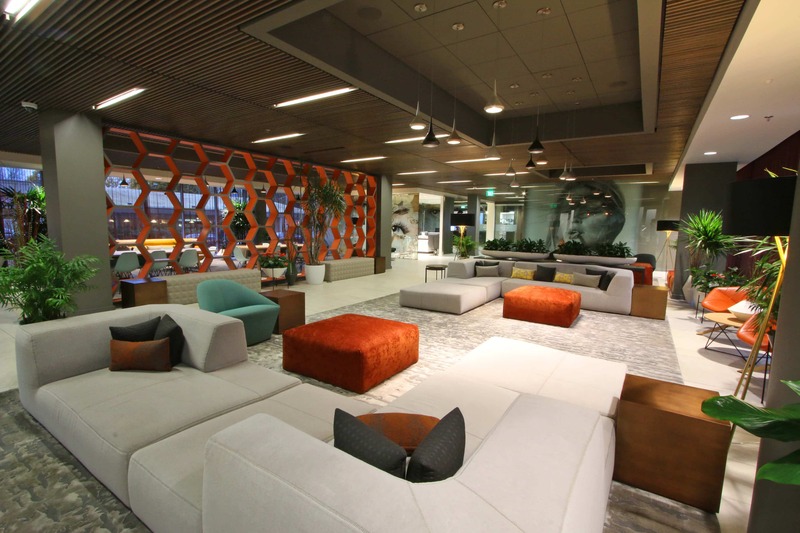 It’s also close to the airport and to public transportation with the MAX Light Rail and the Portland Streetcar both located adjacent to the hotel. Recently recognized as one of the top new hotels of 2015 by USA Today’s 10best.com, Hotel Eastlund boasts a strikingly modern and chic atmosphere with lots of windows and natural light, comfortable beds, a well-equipped gym and a 24-hour business center. 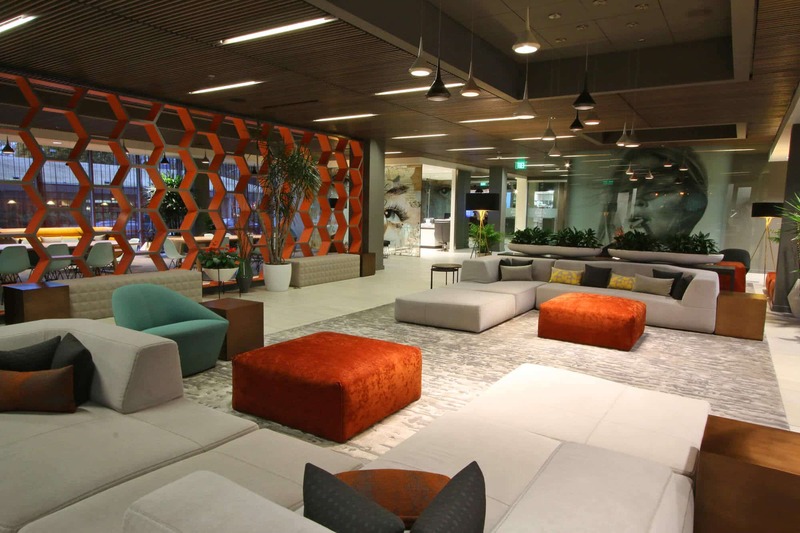 The 24-hour business center and gym. The rooms are new, clean and comfortable. 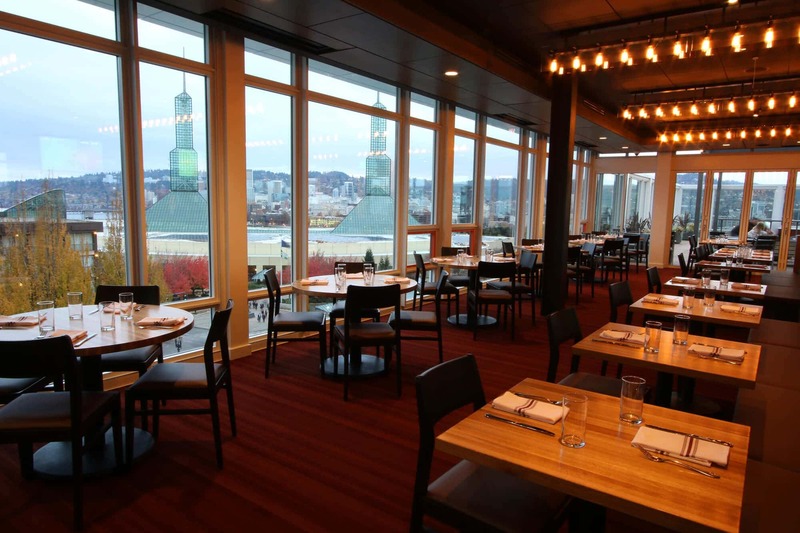 Two other factors that make Hotel Eastlund shine are its restaurants, Citizen Baker and their gorgeous rooftop restaurant Altabira City Tavern. 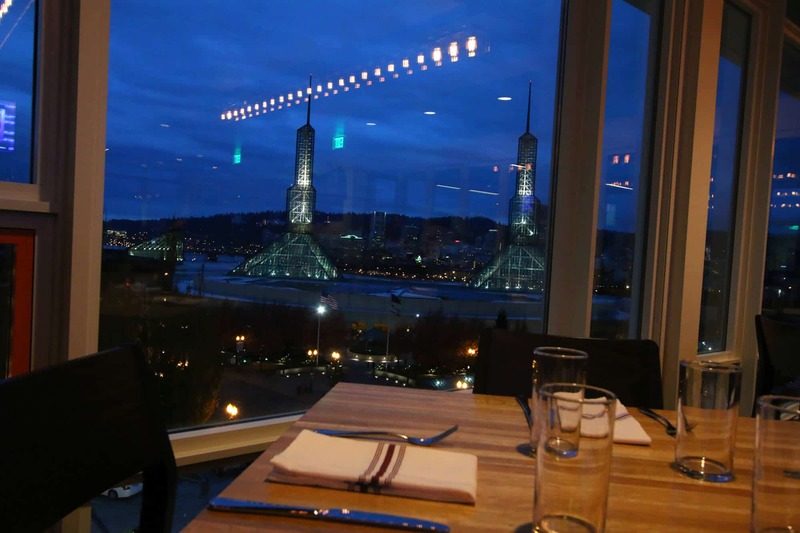 Both restaurants are owned by Portland chef/restaurateur, David Machado. Citizen Baker offers breakfast and lunch and features hand-crafted breads and pastries and creative soups and sandwiches. Windows line two of the walls, letting in the natural light even early in the morning. We joined Citizen Baker for breakfast. We enjoyed a hearty breakfast: Omelet and hash browns with some extra sides and a plate of red flannel hash boasting the freshest ingredients. Filled with a comforting breakfast we were ready for our day of meetings. Later that evening we came back to the hotel to enjoy dinner at Altabira City Tavern. This rooftop restaurant provides a modern yet casual setting. We sat next to the window as the day approached dusk and enjoyed the views of the city as the skyline changed hues and merged into night. It was a gorgeous setting for dinner. We were seated and began our evening with some truly exception drinks. We don’t drink alcohol and I asked the bartender if she could whip us up something virgin and I told her she could surprise us. She concocted two thoroughly delicious mocktails: Pomegranate-rosemary and Pineapple-ginger. Seriously good. We enjoyed the drinks while we perused the dinner options. Service was friendly and quick and being able to enjoy the views during the wait made it go by even faster. We started with a couple of salads: The Bibb Lettuce with Roasted Grapes, Goat Cheese, Marcona Almonds and Limoncello Vinaigrette and the Honey Poached Carrots with Baby Kale, Lebnah, Spiced Nuts and Mint Vinaigrette. That was followed by their House Made Charcuterie Board with American Kobe Beef Jerky, Country Paté and Chicken Liver Mousse. And even though they didn’t exactly fit with the theme of our dinner, I simply had to try their Sweet Mayan Onion Rings with Malt Vinegar Aioli. The onion rings were unique in that the batter was made of cornmeal and had more a dense and chewy consistency rather than the usual shatteringly crispy texture. For our entrees we had the Snake River Farms Sirloin Steak with Scalloped Potatoes and Altabira Steak Sauce and the Braised Pork Shank with Butternut Squash and Chorizo Cassoulet. I had the latter and the meat was so incredibly fork-tender, I really enjoyed it. While we were waiting for our desserts I took a quick step outside onto the rooftop deck. Even though the weather was cold outside, the fires kept the room warm and cozy. The atmosphere was terrific. It was soon time for dessert and I have to say, while all of our food up to that point was good, where Altabira really excels are in its drinks and desserts. I’d gladly go back for those alone. We followed our waiter’s recommendations and ordered the Caramel Apple Cheesecake with Cinnamon Streusel and Gingersnap Crust and the Lemon Bar Tart with Lavender Ice Cream and Huckleberry Sauce. Both were absolutely fabulous! We were both full after our entrees and were amazed that we had no problem finishing off every last morsel of these delectable desserts. 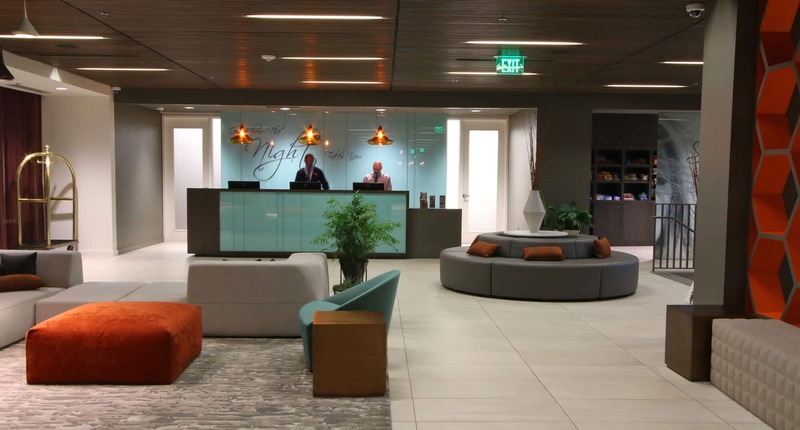 We enjoyed our stay at Hotel Eastlund and if you’re planning a visit to Portland, particularly the Eastside, and are looking for a contemporary luxury boutique hotel complete with amenities and great dining options, we highly recommend it! For more about Citizen Baker, visit their website. For more information about Altabira City Tavern, visit their website. Thank you to Hotel Eastlund, Citizen Baker and Altabira City Tavern for hosting our stay. As always, all opinions are entirely my own. I am planning to go to Portland twice next year – thank you so much for the recommendations! Portland is on our list of places to visit and your review just convinced me of staying at this hotel when we do! Fabulous, have a blast there, Marnely! I adore Portland, and it’s time to go back and try a new hotel. Love this one! I hope you make it back to Portland soon, Lori! I live in California and have never been to Oregon, but I know where I want to stay if I go there! Sara, you’ve GOT to visit Oregon! And of course no visit to Oregon is complete without a visit to Portland. So many things to see and do and it really is a terrific foodie city! Portland is just a short drive away from me and I love little get aways for a night or two! I will have to check this place out, looks stunning! Same here, Megan, and being so close to Portland it’s one of our favorite getaways. 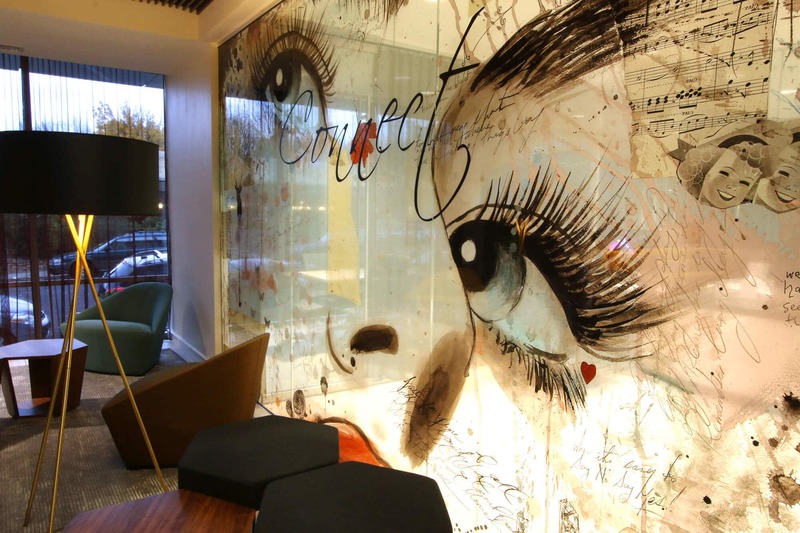 The Hotel Eastlund is brand new and super sleek, you’ll definitely need to check it out! What a fun adventure – that cinnamon streusel makes me want to jump on a plane! Oh my gosh, Kimberly Ann, the desserts were seriously awesome, their pastry chef rocks! What a really lovely looking hotel, I’d love to visit Portland some day! I hope you do, Sheena! 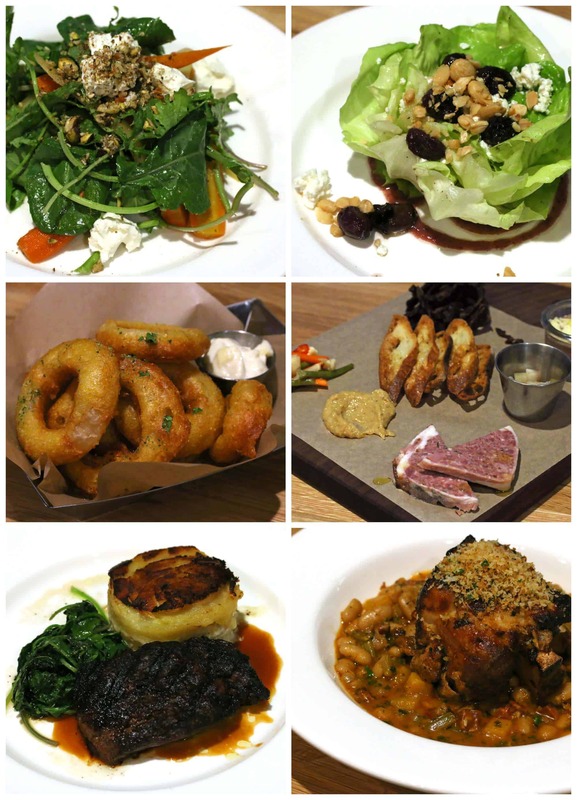 I’ve heard great things about the foodie scene in Portland and it certainly looks like you had a delicious trip! It’s regularly been voted one of the top foodie cities in the nation, Jennifer, there are so many great options. I love trying new places and it was fun visiting Altabira in particular! Portland is one of my favorite cities, so I am bookmarking this for our next visit. I need to try that tavern! Awesome, and YES, you need to try it! The views and atmosphere alone are worth it! I love Portland and can’t wait to go back. Now you’ve given me a new hotel to look into! It looks like a great place to stay. It’s brand new, Joanie, and hands down the best hotel in the Lloyd District. Add to that the fact that it has two great restaurants and it’s a winner! This is beautiful! I’ve always wanted to go to Portland, even more so now! I hope you make it there, Becky, you’ll love it! What a gorgeous hotel – and those views are amazing!! I’m heading back to Portland in a few months and definitely need to check out this hotel – or at least stop for a meal! Kimberly, I live in southern Oregon. Never been here, but it’s on my bucket list now! Looks lovely, and I so love coming to the city for the weekend! Portland’s such a great escape for us, too, Sandy. 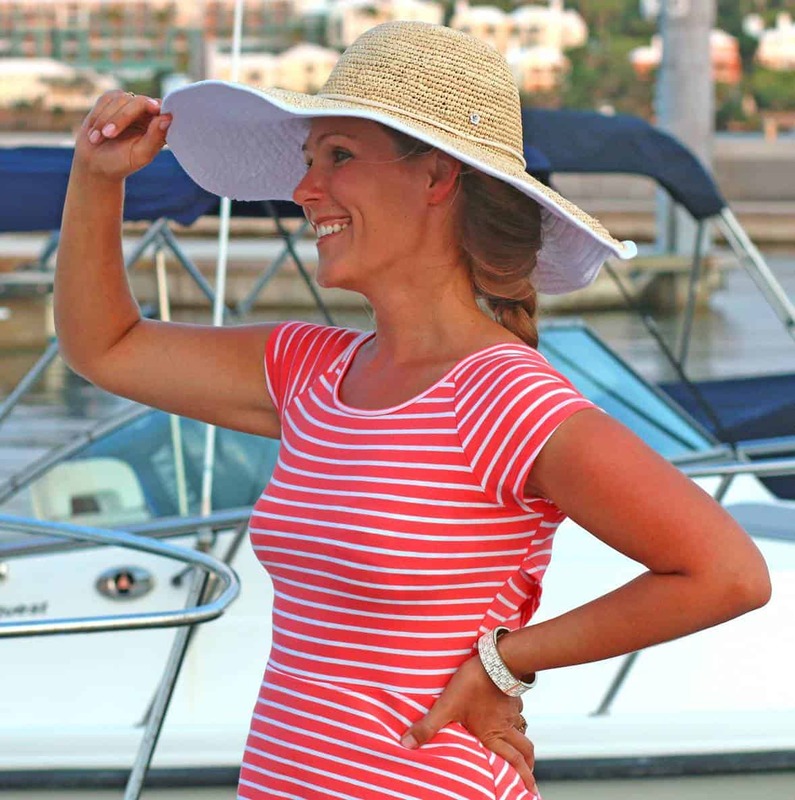 We live just 2 1/2 hours away and it’s one of our favorite couples getaways!